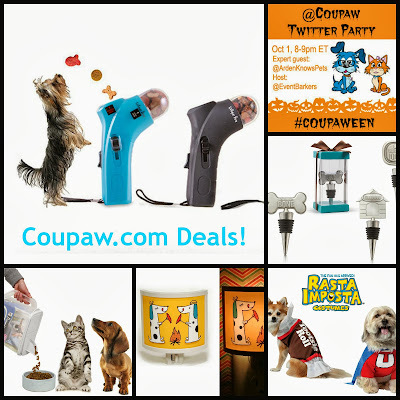 We're sure having fun watching all the daily deals come streaming by from Coupaw. And the prices; wow! The treat dispenser in the largest image above really caught my eye. It looks like a fun, indoor activity--something to do on a rainy day or during indoor playtime with Tanner and Oliver. Which dog do you think would be better at catching the treat? RSVP for the party at this link. selections, join us tonight to see if you can win a $25 credit. And do stick around. 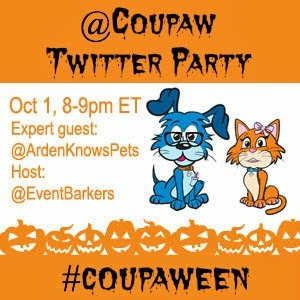 Our Grand Prize winner at 9 PM ET will also score a custom oil painting by Debbie Sampson. And one last little tidbit--if you're not a winner tonight, watch for our promo code offer that will be available to party guests for a limited time. See you tonight! 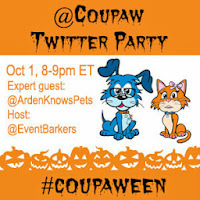 Through our Event Barkers partnership with DogTipper.com, All Things Dog Blog enjoys producing Twitter Parties and other social media events to help promote pet brands that we love. We only bring you news and opinions on those companies that we support.